Get all the latest information and news about Wardle Family YMCA programs & events in our monthly newsletter! (March 5, 2019) Port Royal, SC: The 2019 SC YSSC CYSL Winter Swimming Championship were held March 2-3 at the Middle Tyger YMCA in Duncan, SC. Twenty-seven BYAC Tigersharks swimmers qualified and competed in relay and individual swimming events at the meet. BYAC swimmers placed in the top ten in 48 Individual events and swam their best times in 78 events; improving their times by as much as 12 seconds. In individual scoring, BYAC had three swimmers earn High Point Awards in their age groups; Lily Bostwick earned 1st place in the Girls 13-14 age group, Sovann Shook placed 3rd and Jacob Mansker earned 2nd place in the Boys 8 & Under age group. 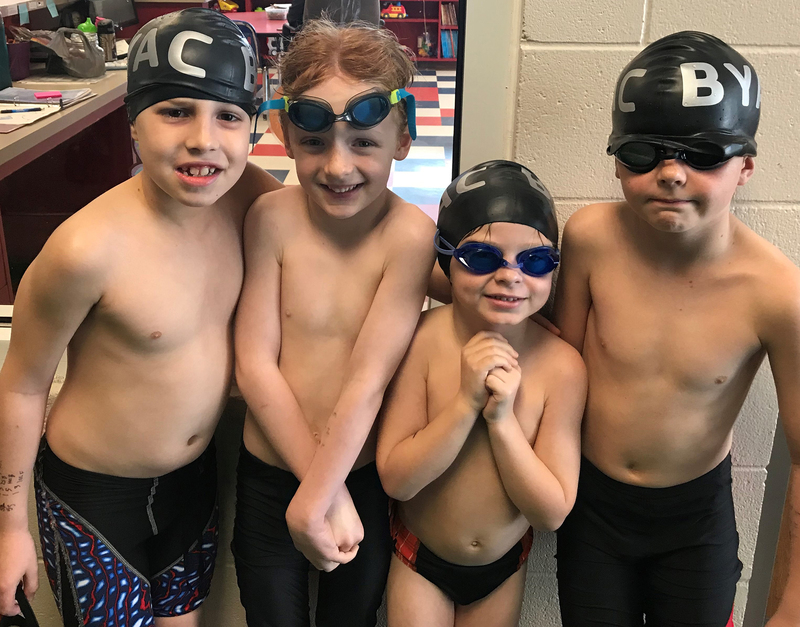 The 8 & Under Boys Relay Team of Canyon Ulrich, Mack Hipp, Jacob Mansker and Sovann Shook earned 3rd Place in the 100 Yard Medley Relay event and the team of Finn Geistkemper, Canyon Ulrich, Mack Hipp, and Jacob Mansker placed 3rd in the 100 Yard Freestyle Relay event. The Boys 10 & Under Relay Team of Sean Lyons, Sovann Shook, Tyson Curtis, and Killian Geistkemper earned 6th place in the 200 Yard Freestyle Relay. Lily Bostwick, Melanie Schiller, Grace Shirley and Brooke Cushman placed 6th in the Girls 11-18- 200 Yard Medley Relay event. Six swimmers are going on to the SC Upper Southeast Regional YMCA Short Course Championship Meet in mid-March, including Olivia Byrne who qualified in 9 events. Congratulations to all the BYAC swimmers! The BYAC Tiger Sharks swim year ’round. Interested swimmers should contact the Wardle Family YMCA located at 1801 Richmond Avenue, Port Royal or call 843.522.9622. Scholarship assistance is available for qualified applicants. Please join the Wardle Family YMCA on January 19th at the Walsh Palmetto Room at St. Peter’s Catholic Church on Lady’s Island for the Beaufort Beach Ball Fundraiser & Auction presented by Bank of America Merrill Lynch. Doors open at 6 pm for music and dancing with Deas Guyz, silent auction, golf cart raffle, heavy hors d’oeuvres and full tikki bar. Event tickets are $65 each or $120 per couple and $75 each at the door. They can be purchased at the YMCA in Port Royal (1801 Richmond Avenue) or online: beaufort-jasperymca.org. This year’s golf cart raffle was supplied by Sutcliffe Golf Cars and is a 2009 Yamaha model with head lights, flip back seat, new tires and batteries and comes in cheerful yellow. Golf cart raffle tickets are on sale now at the Y and at the event for $25 each and 5/$100. The winner will be chosen at the Beaufort Beach Ball on the 19th, but you do not need to be present to win. The Beaufort Beach Ball volunteer committee has been working for over a year to throw the biggest, most-bodacious beach bash this side of Palm Beach! This year’s silent auction includes many wonderful items – large and small – from a complete 3-ton HVAC system to a trip to the California wine country to restaurant and spa gift certificates, a custom crafted live edge walnut coffee table, sports equipment, airline tickets, Walt Disney World Park Hopper tickets, artwork and more! The online silent auction will open for preview January 4, 2019 (visit beaufort-jasperymca.org) and online bidding will open Jan. 14. Bidding will close at 9:30pm on January 19 and winning bidders can pick up their item(s) during the Beaufort Beach Ball or at the Y in Port Royal on Monday, January 21 starting at 11 am. This event is the only capital fundraiser for the Wardle Family Y and all proceeds will go toward an extremely important video surveillance system upgrade for the Wardle Family YMCA. Publix Super Markets Charities, Dean Hewitt, Cross Community Church, Lowcountry Insurance Services, Inc., May River Dermatology, Beaufort Memorial Hospital, Ralph& Dolores Fuller, Hargray, Fred & Everette Kuhn, Madison’s Market, Carmen & Don Meyer, and Republic Services. Amy & Will Achurch-Ballenger Realty, Beaufort Dog, Beaufort Janitorial Services of the Lowcountry, Betty Laurent Photography, Gary & Jan Caron, Gilbert Law Firm, J&J’s Barber Shop, Palmetto Vending, Planting Roots Hydroseeding, Saulisbury Business Machines. In-Kind Sponsors: Adams Outdoor Advertising, Amazing Event Rentals, Battery Creek High School Cate Program, Lowcountry Radio Group, Murr Printing, New South Shirts, Salt Marsh Brewing Co., Sutcliffe Golf Cars, The Island News.